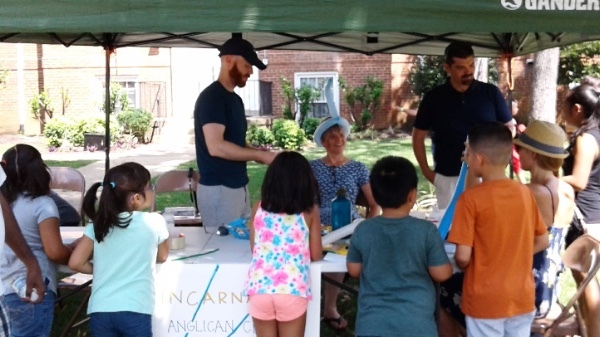 In the Fall of 2014, as our congregation, Restoration Anglican Church, moved into our new facility that is located just north of the Ballston Metro stop in Arlington, we began to dream about what it would look like to help plant other new Anglican churches inside the Beltway. That desire led to lots of conversations, strategy sessions, times of prayer, and listening to the insights of our members. Out of this emerged a vision to plant a new work in South Arlington. A few key leaders stepped forward to help direct this effort – Rev. Liz Gray (associate rector at Restoration), the Rev. Morgan Reed (a newly ordained priest in our diocese), and Amy Rowe (a key lay leader and a postulant in our diocese). They are now in the process of gathering a launch team to help plant this new work, which will be called Incarnation Anglican Church. This is an interview I had with this team to let you know more about this emerging work. Amy: My husband and I have felt a call to cross-cultural ministry since we were in college. We always anticipated that this would mean a move overseas at some point. But instead, when we moved to South Arlington, we discovered that God had brought people from all over the world to our doorstep. We love living in such a vibrant, cross-cultural neighborhood, where we are more likely to hear Arabic than English on the playground, and the gas station on the corner sells freshly made injera. Almost since the day we moved into our house here, we have been asking God to send us people who would join us in befriending and praying for our neighbors. So, when Restoration announced its church planting efforts here, it felt like a clear answer to our prayers. Morgan: My wife, Ashley, and I moved to south Arlington back in 2012 because we wanted to live in Virginia and needed an “inexpensive” place to live while I did graduate work at the Catholic University of America. After beginning the ordination process, Bishop John reminded me of the importance of a priest getting to know his or her neighbors. We took that exhortation seriously and began getting to know our neighbors’ names and being a part of their lives. Because this had become a normal rhythm of life for Ashley and I, when we heard that Restoration wanted to plant in our zip code, God seemed to make it clear that this is exactly what he equipped me for. 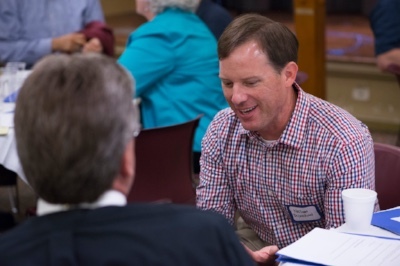 My academic studies and upbringing have made me a bridge between several different Christian communities and I long to see a church that bridges not only ethnic communities, but partners with local churches to see the Holy Spirit transform neighborhoods. Liz: In my outreach role at Restoration I have had the huge privilege of working cross culturally in many different countries over many years, and with church planters in many global contexts. When Restoration began exploring church planting in South Arlington I was immediately intrigued by the fact that all the nations of the world were gathered on our doorstep! Did you know 150+ languages are spoken along Columbia Pike? So, I have jumped in - My husband and I have sold our North Arlington home, and we are now moved into a local community in South Arlington. We are curious as to whether our new neighbors already know Jesus, and praying that if they don’t we can be a part of their journey to know him. What excites you about serving in this particular community? What is unique about this place? Amy: I love the ethnic and socioeconomic diversity of this neighborhood. A few weeks ago, my kids and I were playing in a neighborhood park which has a stream that runs under a bike path. A big family of immigrants was splashing in the stream; the kids were playing while the mother beat wet clothes against a rock, presumably doing her washing. Meanwhile, cyclists in expensive gear whizzed past overhead. What would it look like for these people to worship Jesus together? In planting a church in this context, I see an opportunity to grow a community that reflects God’s ministry of reconciliation and the rich diversity of heaven. Morgan: There is a beautiful diversity in these neighborhoods that is complemented by a desire to create healthy neighborhoods. In some of our prayer walks throughout South Arlington, we discovered that some families have lived in their home for generations (a rarity for the DC-Metro area). Several times a year, one of the civic associations organizes food-truck gatherings with a host of cuisines and live music. These neighborhoods care about healthy relationships and quality of life. When I grill in the public park, it seems like every table around me is speaking a different language and this kind of diversity excites me for what God might do when we build relational bridges. How have you seen God at work as you have begun to lay the groundwork for this new church? Amy: This preliminary work is slow and sometimes discouraging, as the task ahead of us is far too big for us to accomplish in our own strength. But God has provided steady reassurance from his Word, his Spirit, and the well-timed encouragement of others all along the way. And there have been some very specific, incredible answers to prayer that re-energize me. I’ll share one story: One evening, I was feeling discouraged because one family who had shown initial enthusiasm was no longer interested in joining the church plant. I cynically texted our team, wondering whether anyone would come to this church at all, when an Ethiopian woman knocked on my front door and started up a conversation in halting English. Thirty minutes later, she shared that she was looking for a church home in South Arlington! It seemed that God was gently reminding me that of course people would come to this church; just not necessarily the people I had envisioned. Liz: I have another story to add: Amy and I were looking at potential worship space properties with a realtor. In one particular property, the rental space was downstairs while the owners lived upstairs. Before we even fully understood what was happening, the realtor had brought us upstairs to meet the owners. We found ourselves sitting around the kitchen table with the property owner, an older Iranian woman who fed us cookies and teared up as she talked about her husband’s illness (he was asleep in the bedroom) and her distant grandchildren. We offered to pray with her, and she told us a story of a dramatic encounter with Jesus in a vision earlier in life, and professed that she had loved Jesus since that day. We prayed with her in the name of Jesus and prayed a blessing over her home. It was not at all what we expected from that realtor appointment, but exactly what God had in mind for us in that space at that time. It reminded us that God has already gone ahead of us to work in the hearts of people in this neighborhood. Morgan: One day during the summer we worked with several local churches to give away back-to-school supplies to the surrounding neighborhoods. God provided us someone in the launch team who is nearly a professional balloon modeler (i.e. he’s great at making balloon animals). Families were lining up on both sides of the sidewalk so that kids could come and get their balloon puppies or balloon swords. He taught me how to make a sword as well, and so standing there in my collar behind the table, I made sword after sword. This was a very incarnational moment as I reflected on who we are as Anglicans (having a formal grounded-ness) and who we are as Incarnation (approachable, thoughtful, caring). After we finished with all our balloons, we had a chance to pass out cards to people and offer prayer. The response that people of various ethnic communities had was that they were excited we were there to love and serve them, and one gentleman that I spoke with found comfort in knowing that I only lived two blocks from him. Moving forward, God keeps reminding me that I might be the priest wearing an alb in the sanctuary and having a balloon hat on my head during the coffee hour...and I love that! What challenges or potential obstacles are you facing right now? Amy: Worship space is a big one. Although our particular corner of Arlington is comprised of many working-class families, the cost of living is still high, and rental space is at a premium. Balancing our competing needs for strategic location and financial feasibility is challenging. Another challenge has been what feels like heightened spiritual attack. Some of this has been in the form of health issues in ourselves and our families. Physical and spiritual weariness is intense at times. And finally, being bi-vocational is stretching and challenging for all of us. Liz works full-time at Restoration; Morgan and I both work part-time; all three of us are students; and we all have families who need and deserve our attention. We want to plant a community that is restful and balanced, but to do so, we must embody healthy rhythms of work and rest in our own lives. Liz: I would agree with Amy—finding boundaries of time and space for rest! Also, knowing exactly where to worship as we begin. How can others in the diocese pray for you or support you? Morgan: Prayers for guidance. We want to allow enough time for the Holy Spirit to form us according to the very specific needs of South Arlington. Personally, I would love prayers for productivity in my dissertation. Sometimes I am embattled by the discouragement of trying to fuse my generalist/pastoral calling with my specialist/academic calling. I invite prayers against that discouragement and invite creative input on how others have done this in their setting. Liz: Prayers - yes! Please! If anyone would like to get more specific prayer requests please email me, liz@incarnationanglican.org And pray for us for clarity, wisdom, godly intuition and much joy in the process of finding where God is working and leaping in to join Him! We are diligently working on the website (incarnationanglican.org), but until it is finished, you can keep up-to-date with what is happening on our Facebook page or send Morgan an email (morgan@incarnationanglican.org) in order to be added to our prayer letter. The Rev. 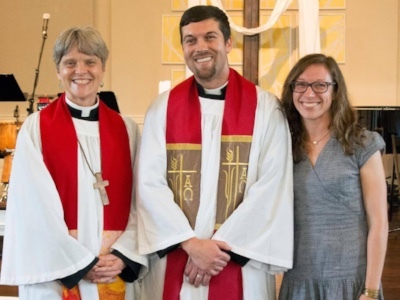 Nathan Dickerson is the Associate Rector at Restoration Anglican Church in Arlington, VA.